Someone recently turned me on to the AeroPress coffee maker. The AeroPress makes fantastic tasting coffee that supposedly has about 20% of the acid of regular brewed coffee. You can pick one of these gadgets up for about $25 or less, and it's worth every penny. Just trust me on this, the coffee it makes is fantastic. 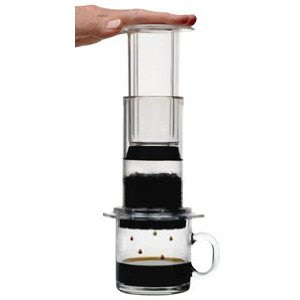 Head over to the AeroPress website, then go to Amazon.com and pick one up for yourself. You won't be disappointed. Posted in Miscellaneous, Opinion . Bookmark the permalink. RSS feed for this post.